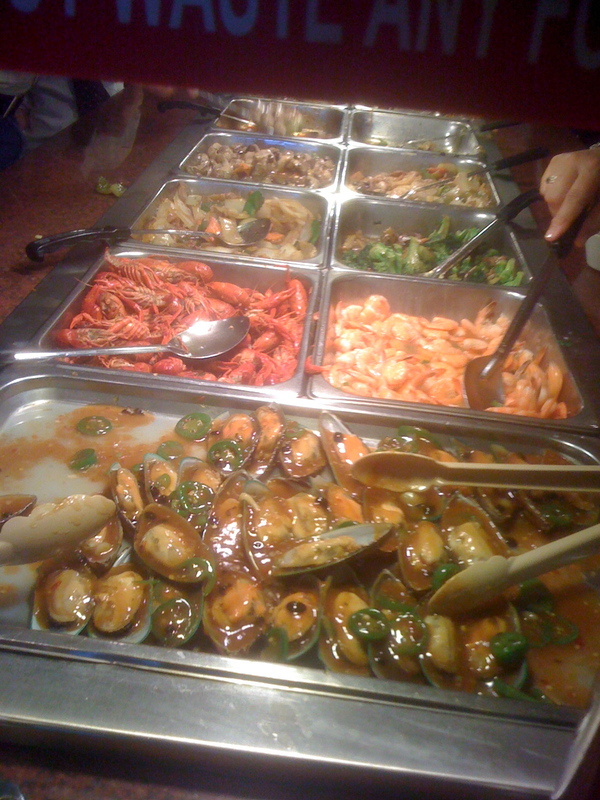 The local Chinese buffet features boiled crawfish alongside Chinese buffet standards. I think the boiled shrimp stand a chance of Chinese ethnic authenticity alongside the mussels on the layout at New Peking Chinese Buffet in Eunice (Cajun Country), Louisiana. But the boiled crawfish? These local Chinese entrepreneurs simply understand what they need to do to appease local taste buds to keep the Cajuns coming back. And in this crawfish season of the year, that means serving Cajun-styled boiled crawfish right alongside mussels and General Tso’s chicken. On another part of the buffet, for that matter, I noticed pizza, fried onion rings (the processed frozen food kind), and French fries. Is there such a thing as Chinese pizza? Chinese fried onion rings? Chinese French fries? This makes me wonder if I went to a Chinese buffet in Philadelphia, would I find Chinese Philly Cheese Steak? Or if I went to Jackson, Mississippi, would I find Chinese fried okra and grits? Or if I went to South Texas, would I find Chinese tamales or tacos? In the end, here’s the question: Is there really such a thing as “Chinese food” on an American Chinese buffet spread? My theory is that the Chinese buffet menu has become an ethnic genre of its own: part Chinese, part American, but full-blooded capitalistic opportunist. Of course, I’m not complaining, just offering some observations. As long as the price is right and the food is tasty, of course, I’ll keep going back to New Peking, the Sunday-after-church-place to get boiled Cajun crawfish with egg fu yung on the side in Eunice, Prairie Cajun Capitol of the World, Louisiana. 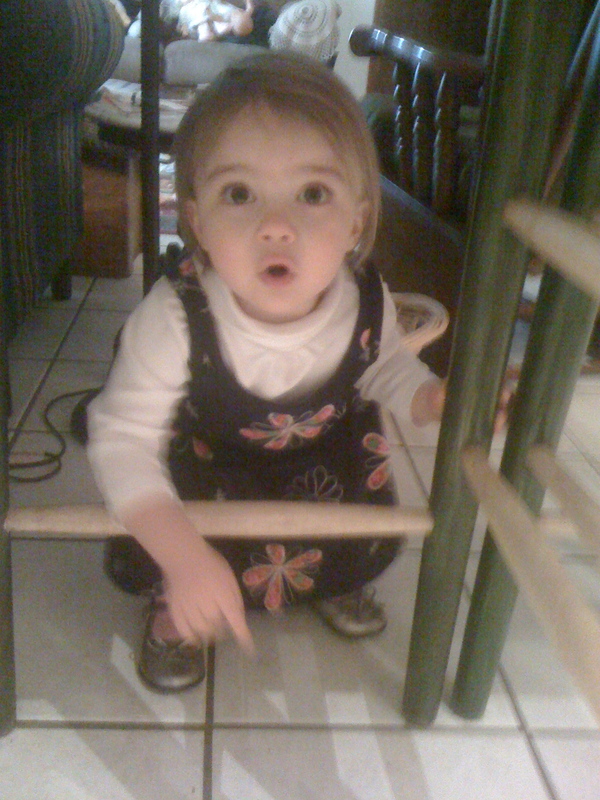 Honey put Payton up to a sing-along Thursday: “I love my house.” The words aren’t altogether distinct, but obviously, the little almost-two-year-old priss is growing her linguistic skills. But mostly, as far as Papa can tell, she’s growing her cuteness skills! 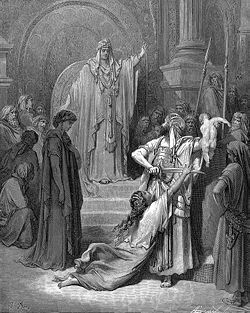 The Judgment of Solomon: Compelling words, then and now! Guilty art thou, o reader, even as I! I worry from year to year at the church’s annual 5k fundraiser that I should consider bowing out. Year upon year, I sense the competitive edge growing dull: This year, I felt bad all week with allergy symptoms and arthritic (or whatever) aches and strains. No way, reasoned I, that I could pull off the Saturday morning race. Almost reluctantly did I enter, and that at the last minute, mainly because I knew the community fundraising cause is worthy, whether I ran the race or not. But when the bell rang to race, I must confess, I managed. More than managed, in fact: I beat my time from last year, which had beat my time from the year before. And I placed first among men in my age category. All of this leads me to wonder which way I’m growing: older or faster? Sarah placed first in her category, too. Whatever our running disease, it’s consistent in the family. We’re just jogging nerds! Sarah poses at the finish line after setting the pace for her peers. For all the shopping prowess of my wife and daughter, each of whom can spend seven dollars in seven hours at the mall and come home with a trunk full of clearance loot, I one-upped them last Tuesday. They were bound for Lafayette to shop for running shoes for Ann. I needed a new pair of slippers badly, and not knowing what else I could do on a cold Mardi Gras holiday with the outdoors too wet and muddy for any outdoor activity, I declared I’d go with them to find my slippers. I reasoned this clearance season on winter goods could conjure up a rare bargain–maybe 50% off or something like that, meaning a pair of slippers for $5 or $10. My slippers were similar to this, but gray with Mike the TIger poised over the LSU logo in purple and gold. When we left home, I supposed I would find my bargain at one of the mall department stores. 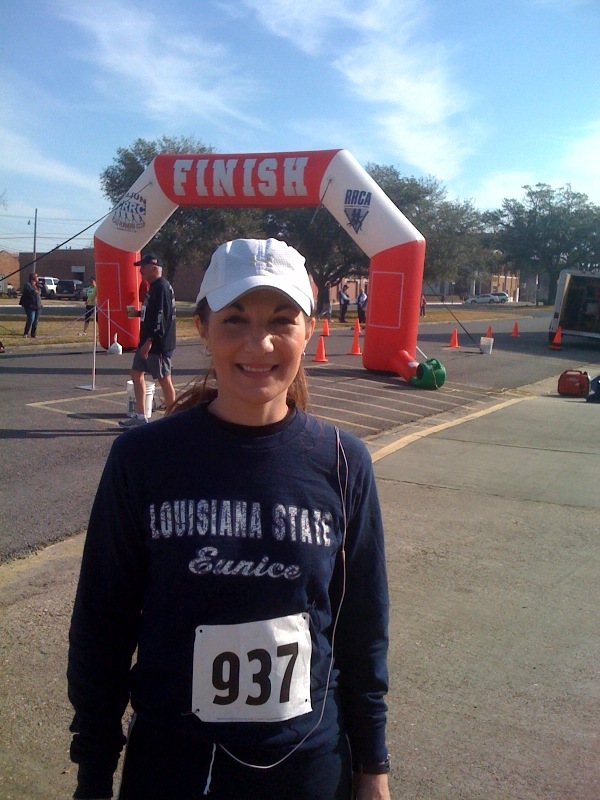 But we started at Academy Sporting Goods, where Ann hoped to find some new running shoes. To amuse myself while Ann shopped, I visited the casual footwear section and found, to my surprise, slippers! And not just any slippers: They were LSU Tigers Collegiate Footwear slippers, emblazoned with the Tiger and the LSU logo. So I approached the cashier with my stylin’ LSU slippers and laid them on the counter. I had extracted my Discover card from my wallet and clutched it, ready for duty, in my right hand as she swiped the bar code. I was stunned. Speechless. I asked her to repeat. I gulped really hard. I didn’t have a penny on me (“Gold and silver have I none, but I have a wallet full of plastic!”), so I turned to Sarah and begged a cent. Of course, she had petty change in her wallet, so she “bought” me these gorgeous (and comfortable) LSU slippers. This evening, I looked online to see what kind of bargain I really got. I never found the exact pair of slippers I bought, but among the dozens of LSU slippers I found at various sites, the going price tended to be $20-$25. I got a pretty good bargain! I can’t stop writing about the Super Bowl. Sorry. That caption was accompanied by this photo showing Payton on his duff after being unceremoniously removed from the play by Saints defensive end Will Smith, blocking for the streaking Tracey Porter. Porter was bound for the end zone with the coup de grace play of the game while Payton looked on from the turf. I wonder what was going on in Payton’s mind at that point. 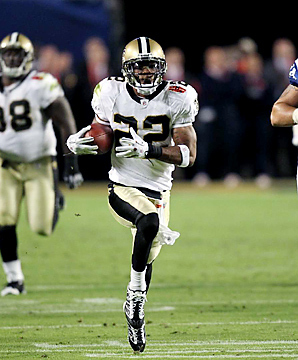 The only view I saw of Payton after the game on TV appeared to represent him as striding with dogged determination to get off the field–nothing like the week before when poor old beat-up Brett Favre, who could hardly walk after throwing his game-changing INT to Porter, hung around to embrace Saints Coach and Drew Brees. Kurt Warner of the Cardinals had shown similar sportsmanship the preceding playoff game. No doubt Brett and Kurt didn’t feel like small talk, but they were pretty classy, anyway. I wish I’d have seen a similar gesture from Payton, a guy who’s always been admired by Saints fans. What a pity we had to line up on opposing sidelines! 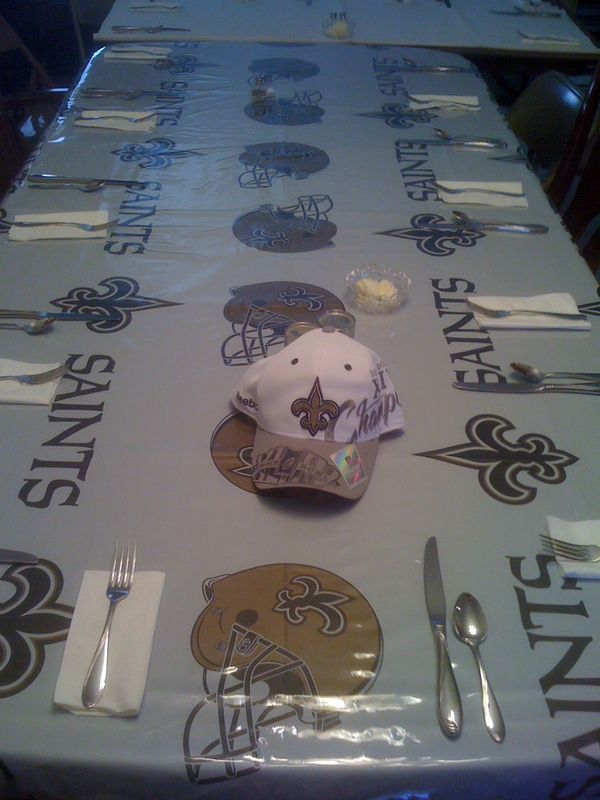 We had a family gathering today at my sister’s in Bogalusa. In keeping with the spirit of the season, the decor was black and gold: We’re having quite the good time milking this Super Bowl championship. but nice while it lasted. 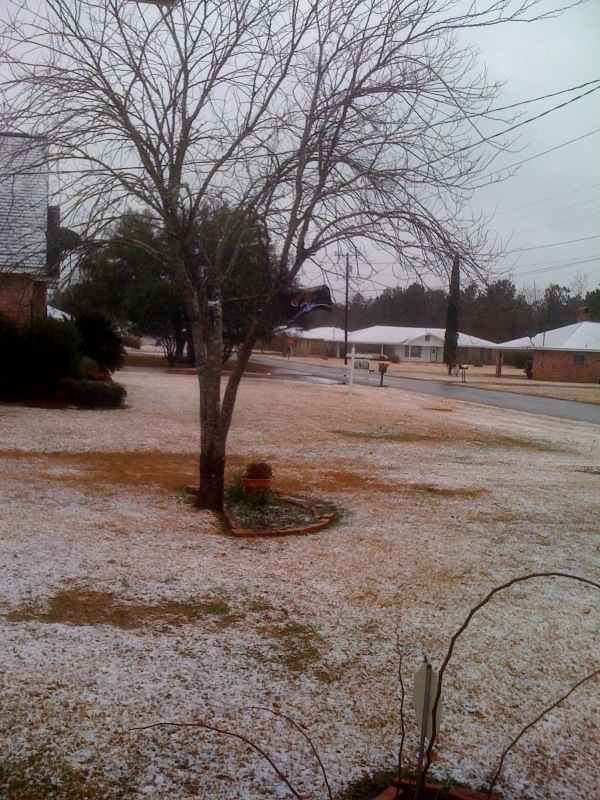 When I got up about 7, the snow was falling moderately. The neighborhood from the front yard shows the ground was just beginning to cover well when the snow stopped. Shucks. The rooftops were covered solid and the open grassy areas particularly were almost pure white. But then the system glided off to the east, the temperature began to slowly rise, and just about as soon as the promise of winter wonderland materialized, so it melted away. By mid-morning, all that was left was standing water and dreary mud. The video quality below doesn’t show how heavily the snow was falling at the time, but Sadie and Marley the Dogs did seem to enjoy the change of scenery as they went about their first-of-the-morning business. Hey, this is twice in one winter season that we’ve had snow–That’s been many and many a year ago since we witnessed two events! going the other way after Saints’ corner Tracy Porter snatched the pass intended for Wayne and streaked off like a lightening bolt, football in hand. First, all three of the key players in that play are native Louisianians: Manning and Reggie Wayne are from New Orleans, Tracy Porter is from the blue-collar Baton Rouge suburb of Port Allen (jokingly renamed “Porter” Allen after last night’s game). That they’re all Louisiana boys meeting in the Superbowl in Miami is coincidental enough. The irony and the coincidence are more striking considering Porter went from Port Allen to play his college ball at . . . no, not L.S.U. right across the Mississippi River from where he grew up . . . but Indiana University in the Big Ten. 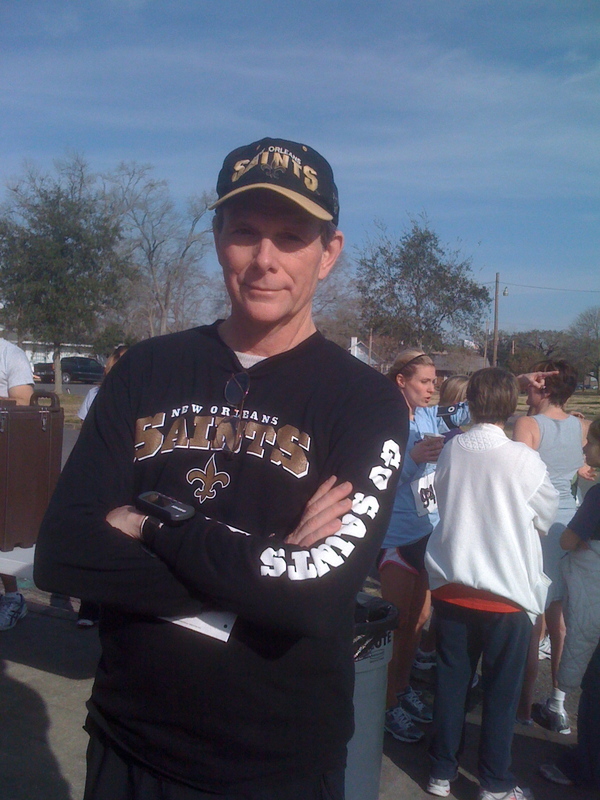 No doubt, he had some Indiana fans regarding him in a Saints uniform as a turncoat, much the same as many Who Dat’s regard Payton Manning as a turncoat (even though the charge is baloney–Payton really is a good dude, and New Orleans should always be proud of him). So there we have it: Louisiana to Indiana and back, connections meeting at a convoluted crossroad around the 25 yard line in Miami, providing the game’s pivotal moment. Alas, poor Reggie and Payton for playing against their home state! Ill-fated, ill-fated! More football to come, but this day, Payton came to spend the day with Honey and Papa. Papa had to work most of the day, but he got to visit before work and during lunch. Payton and Honey had their usual blast. 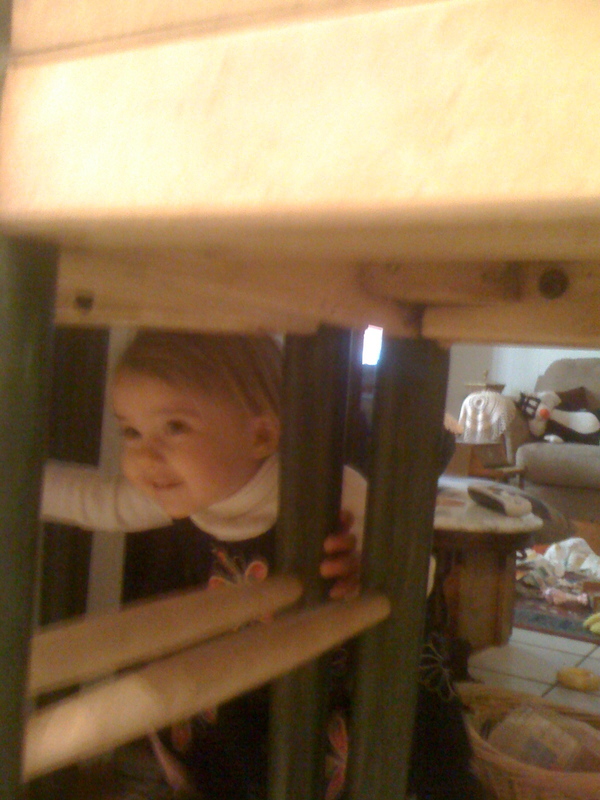 I had a little fun after lunch when she played “Payton in the Jungle” game under the kitchen bar. I don’t need to write much: Images of the almost two-year old’s antics communicate more clearly than any eloquence I can muster!